Kidlet and I are big Glee fans. Our love of singing, dancing, and being wildly over-dramatic fits well with the show :P For those not aware, there is an episode in which one of the characters makes a grilled cheese sandwich that looks like it has a picture of Jesus on it. He calls it Grilled Cheesus and hilarity ensues. I've never even seen an episode but this is funny anyways :) And I have Glee fan family who will LOVE it . Happy summer holidays to you & Kidlet! Hilarious. Husband and I love Glee, too. That is way awesome!!! So funny and cute. 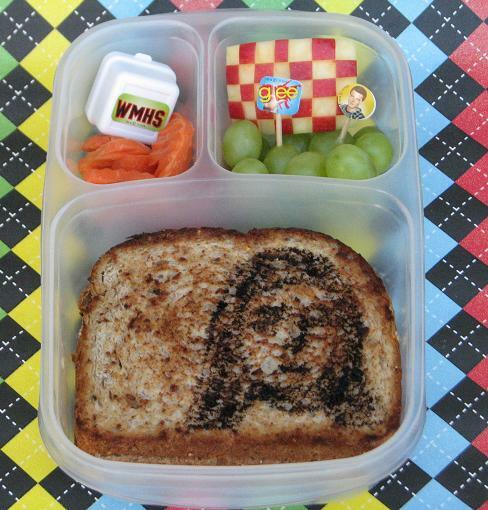 Any Glee fan would be proud to bring that cheesus to school!